AMMAN (Reuters) - The U.S. decision to withdraw troops from Syria will not jeopardize Washington's efforts to counter threats in the region, which come from Iran and Islamic State, Secretary of State Mike Pompeo said on Tuesday. 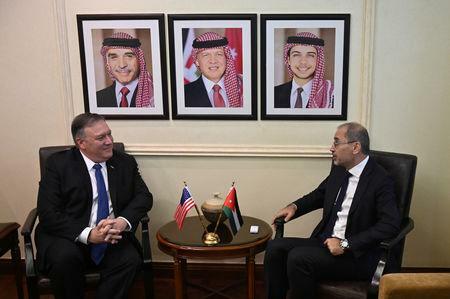 Pompeo was in Jordan, making his first visit to the Middle East since President Donald Trump's abrupt announcement that he will pull the 2,000 U.S. troops from Syria, which caused alarm among U.S. allies in the region and prompted the resignation of Defense Secretary Jim Mattis. The U.S. troops in Syria have been fighting against Islamic State and also served as a counterweight to the Syrian government, which is backed by Iran and Russia. Many of Trump's domestic and international critics have said that withdrawing the troops abruptly could expose Washington's Kurdish allies to repression from Turkey, and also allow Iran to solidify its influence in Syria. But Pompeo said Washington was not stepping down from its efforts to challenge Iran. American policy makers were "redoubling not only our diplomatic but our commercial efforts to put real pressure on Iran," he said. 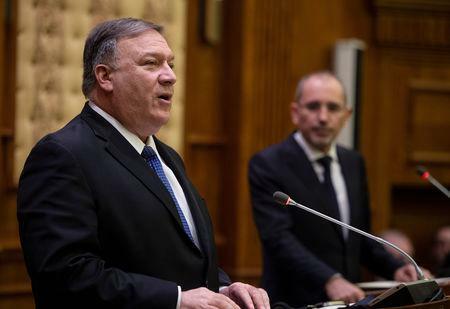 "There is enormous agreement on the risk that Iran poses to Jordan and other countries in the region," Pompeo added. Jordan, which has expressed worries in the past about Iranian influence, particularly near the Jordanian border in southern Syria, said Tehran should refrain from meddling in the affairs of its neighbors Syria and Iraq. "We all have problems with Iran's expansionist policies in the region," Foreign Minister Ayman Safadi said.